Day 1 Mumbai: On arrival at Mumbai airport you will be met and transferred to your hotel. The remainder of the day is at leisure for you to explore this wonderfully chaotic city independently. Admire the ornate buildings which provide a backdrop for noisy street vendors and wander the wide boulevards which are lined with monumental colonial buildings. Day 2 Mumbai: Today’s city tour begins along Marine Drive, before you stop at the Jain Temples and then proceed along Malabar Hill via the Tower of Silence. From here you can soak up the picturesque views over the city. Proceed to the Dhobi Ghats, a huge open-air laundry, and then drive to Mani Bhawan (Gandhi Memorial), the house where the ‘Father of the Nation’ stayed on his early visits to the city. The room in which Gandhi stayed, has been preserved as it was and the scenes of his life are of special interest. 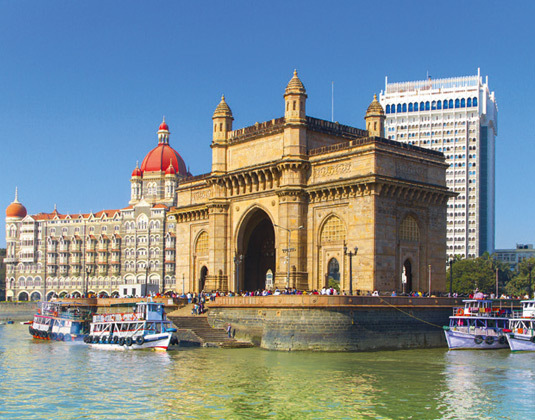 Day 3 Mumbai: Morning at leisure, or perhaps take a peek into Bollywood with our optional Mumbai Dreams excursion, available at additional expense. Transfer to the airport for your onward journey. Situated in the south of the city, the Fariyas puts you within a five minute walk from the Gateway of India and Prince of Wales Museum, while also just 15 minutes from the Rajabai Tower and St Thomas Cathedral. The hotel has two restaurants, a bar, swimming pool, gym, sauna and steam room where you can relax after sightseeing. Superior rooms are modern and comfortably furnished with free WiFi. Accommodation: In superior rooms at the Fariyas with air-conditioning, with shower, mini bar and safe. Upgrade options include deluxe rooms and suites.